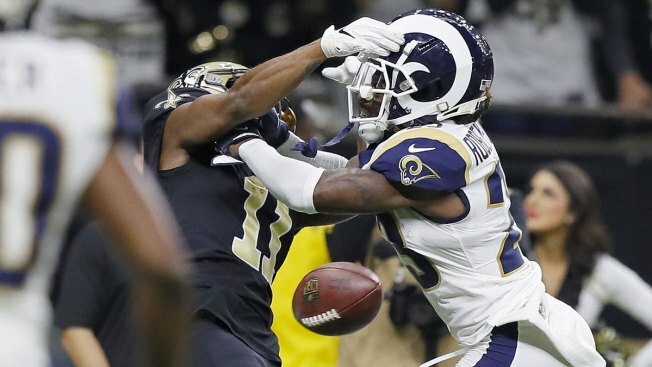 In this Jan. 20, 2019, photo, New Orleans Saints wide receiver Tommylee Lewis is tackled by Los Angeles Rams cornerback Nickell Robey-Coleman during the fourth quarter in the NFC championship game at the Mercedes-Benz Superdome in New Orleans. Referees didn't call pass interference on the play, which helped deny the Saints a trip to the Super Bowl. AP Pro Football Writer Barry Wilner and AP Sports Writer Mike Marot contributed to this report.